Welcome to the official Website of the Tornado Big Band! 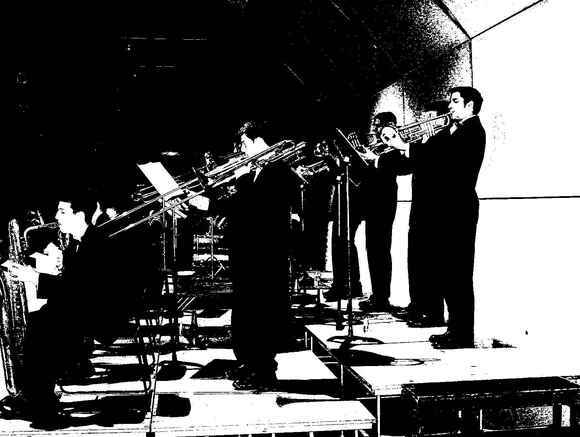 Made up entirely of students from the Senior, Intermediate, and Junior High Schools of the Butler Area School District in Butler, PA, this band is in its seventh year of performing jazz, latin, rock and classic big band songs. Led by music educator and founder, Jeff Kroner, this group is an extra-curricular activity of the Butler Area School District , and members are selected each year through auditions which are open to Butler School District student musicians in the 7th through 12th grade and are usually held in the Fall of each academic year. Help Promote your FAVORITE Band! Visit "The Store" page - where you can find out how to get TBB brand items to show the world who's your favorite Big Band! Any profits generated from sale of these items will go directly to the Tornado Big Band. CHECK IT OUT! The Tornado Big Band played its final concert of the 2009-2010 academic year at the Succop Theater on the main campus of Butler County Community College on Sunday, June 6, 2010. The one hour program included a variety of music including traditional big band, jazz, funk, and salsa tunes. Numerous band members took their turns at improv solos and Alex, Ben, Sarah, and Laura entertained the audience with their vocal solos. The audience enjoyed the program and showed their approval with a long standing ovation. Good luck in your future endeavors and thanks for your talent and dedication to the Tornado Big Band. We'll miss you! The 2010 Tornado Big Band Dance was held on Friday, April 9, 2010 from 7:00 PM until 10:00 PM at the New Lyndora American Legion Hall at 150 Legion Memorial Lane just off of Kohler Ave. The crowd of about 200 people including little children, teenagers, parents, and senior citizens came out dance and to enjoy the music performed by the Tornado Big Band under the direction of Mr. Jeff Kroner, the Butler Vocal Jazz Ensemble under the direction of Mr. Bryan Helsel, and the Faculty Trio of Misters Helsel, Kroner, and Karenbauer. The evening was a great success. Hope to see you all back for the 2011 Big Band Dance.